Solveig climbing down the outside of the habitat in a ripped evening dress at sunrise. That was the image that drove the story. I wanted to get there. And this action -- or, having to do it, having done it -- directly leads to the main character development point in the story. 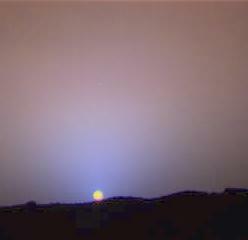 I have not found a non-cloudy Martian sunrise image, so have this one of a Martian sunset. This entry was originally posted at http://lyorn.dreamwidth.org/7154.html. Please comment whereever suits you.